Technical and challenging, some holes heavily wooded. **January 2018. Tee sign holders installed, but no actual tee signs. IA-27 to IA-57 W toward Cedar Falls. Go 1.3 miles to a right on Main St. followed by a slight left in 0.2 mile to remain on N Main St. which becomes Big Woods Rd. which goes straight into the park. Park in the Big Woods Lake parking lot. 1st hole is just south of the parking lot. I grew up in this area and play every time I get back to visit. 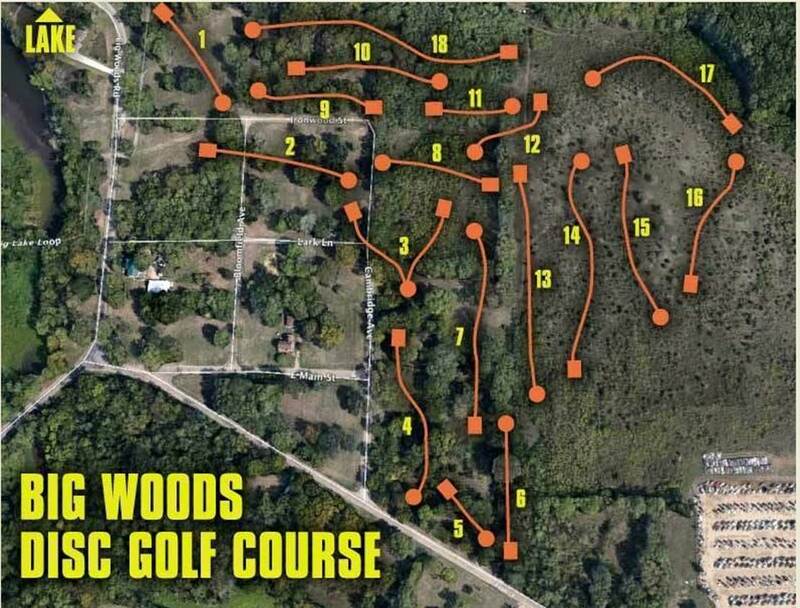 This was the first time I had played Big Woods. Well designed by an experienced disc golfer. This is a very challenging course that requires many different kinds of throws. Some holes have dog-legs to left but many are to the right. Fairways are mowed but most of them in the woods are tight and can be a lot of trouble if you stray off them. Still don't have signs up on the tee box posts but we found that the distance was marked in writing on the sides of most of them. Nice tee boxes and baskets. This is a must-play course for anyone in the area that is a serious player and wants test their ability. Some holes could easily be par 4's. I was happy to to throw +10 (counting all as par 3's).